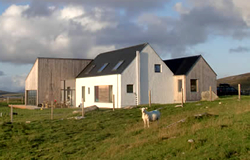 Clachan Lodge is a stunning purpose-built family holiday home located on the north of the Isle of North Uist. The Lodge has six bedrooms and can accommodate up to 12-14 adults with ample space and dining facilities for more. There is a large decking area with BBQ, and it is only a short walk to Clachan Sands beach. The Lodge was designed by a local architect to blend into the surrounding landscape and is intended to look as though a barn and shed are attached to a traditional cottage. The 'cottage' and 'shed' provide 4 large ensuite double bedrooms, from which there are stunning views though floor to ceiling windows. There are 2 further twin/bunk rooms, a bathroom, a shower room and a large playroom above the 'cottage'. The 'barn' element of the building contains the spacious living areas, kitchen, dining area and utility room. The living, dining and terrace areas have unparalleled views over the machair and down to the beaches, from where, in the evenings, the most spectacular sunsets can be enjoyed. With its white sand and turquoise seas North Uist truly is an idyllic holiday destination and this luxurious, modern accommodation ensures comfort no matter how active or restful you intend your holiday to be.